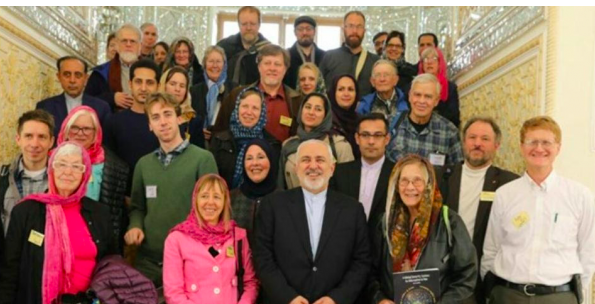 Ann Wright reports on a citizen peace delegation’s recent trip to Iran, which included a meeting with the country’s foreign minister. Despite the International Atomic Energy Agency’s evidence that Tehran was complying with the Joint Comprehensive Plan of Action, one of Trump’s first actions upon becoming president was pulling the U.S. out of the treaty and imposing brutal sanctions on the people of Iran. These sanctions have resulted in the slashing of purchasing power of the national currency by two-thirds. We knew that U.S citizens going to Iran to talk with Iranians about the impact of the sanctions would not be popular with the Trump administration. * * * Despite the visas that Tehran issued to our delegation, we knew our delegation would also be under Iranian scrutiny while we were there. American journalists, IT professionals, retired UN officials and retired and former U.S. government officials have been imprisoned. Despite such considerations, our group still takes these trips. We endure the suspicions of governments to travel as citizen diplomats to areas of the world where our government does not want us to see the effects of U.S. policies on the lives of people in targeted countries. As citizen diplomats, we have been labeled as “naïve tools of repressive governments” when we visited Iran, North Korea, Gaza, Egypt, Pakistan, Afghanistan, Iraq and Yemen, countries where U.S. interference, invasion, occupation or support for other countries’ wars, have made life miserable and dangerous for their citizens. We encounter ordinary citizens who are concerned about the future of their children, their health and education because of military conflict or sanctions touted as a humane substitute for military conflict. We return with their stories, determined to resolve whatever political disagreement is occurring between the U.S. and the particular country. The knives of journalists and pundits were out for Women Cross the DMZ in 2015 when we — 30 women from 15 countries, including two Nobel Peace Laureates — returned from North Korea after holding a peace conference with 250 North Korean women and peace marches with 5,000 women in Pyongyang and 2,000 women in Kaesong. The anti-Semitism label was thrown at us when we visited Israeli-blockaded Gaza and witnessed the illegal Israeli settlements on Palestinian land in the West Bank and dared to speak and write about them. We were called the tool of the Pakistani Taliban when we talked with families of civilians assassinated by U.S. drones in the border area of Pakistan-Afghanistan. Our delegation’s meeting with the foreign minister of Iran has already provoked harsh words from U.S. and Israeli media of collaborating with the Iranian government and FBI warning us about being agents of a foreign government. * * * In the nine days we were in Iran, from Feb. 26 to March 6, we talked with Iranians in schools, bazaars and markets, on squares and in mosques. Many people in Iran speak English. English is taught from elementary school. Young students ran up to us to practice their English. The Trump administration’s travel ban on Iranians means that students who have been accepted to U.S. universities cannot get student visas to study in the U.S. Families with members in the U.S. cannot visit them. Iranians are turning to Europe and Asia. The U.S. travel ban on Iran and the six other countries may have been intended to isolate Iran, but instead America is isolating itself. A surprising number of people, particularly outside of Tehran, the capital, spoke openly about their disagreements with their own government. At a museum in Isfahan we talked with other visitors who were Iranian. Spotting small banners pinned to our backs that read “Peace with Iran” in English and Farsi, people came up to us, invariably beginning with, “We like Americans, but we don’t like your government.” Many of them added, “and we don’t like our government either.” The reasons that we heard for disliking their own government included graft, corruption, those in power living the high life, too much money spent on other countries which should be used at home, mistakenly trusting the United States to lessen or end the sanctions after signing the nuclear agreement. Iranians we met were open about the effect of the latest stringent U.S. sanctions on their daily life. The U.S- sponsored closure of Iran’s access to the international financial system means that ordinary businesses have less access to funds to purchase goods. Apps on mobile phones for paying bills or arranging for car-share rides no longer function. Marriages are postponed as families lack money for the obligatory dowries and wedding celebrations. Purchases of big-ticket items of everything from refrigerators to cars are delayed due to the hyper-inflation of the rial, Iranian currency. From the foreign minister to the ordinary Iranians we met, all reminded us with great pride of the 2,500-year history of their country. 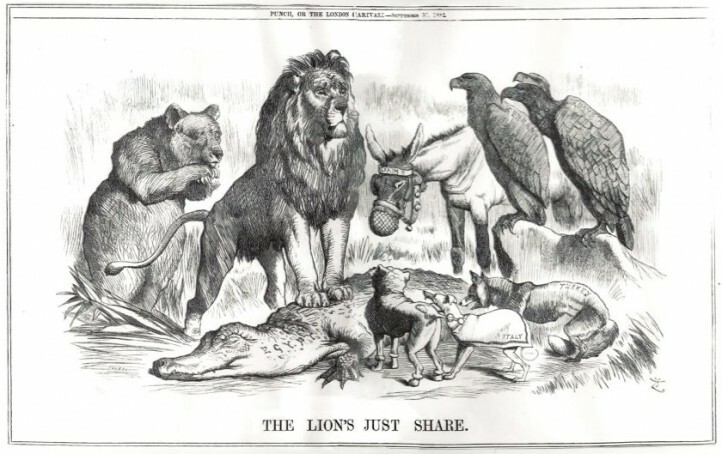 Many spoke of the pressures from neighboring countries and destructive wars waged by neighbors and by countries from afar: the United States, Britain and Russia. 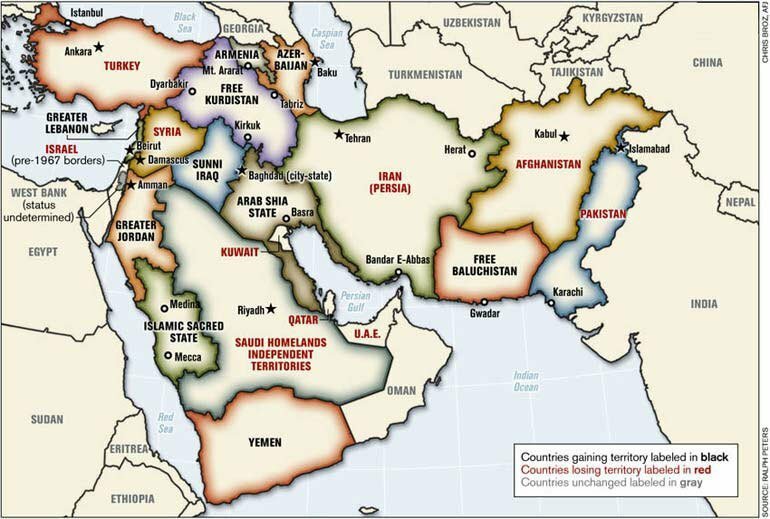 Seven countries are direct neighbors: Turkey, Iraq, Syria, Turkmenistan, Afghanistan, Pakistan and Armenia. Seven more are within 100 miles: Saudi Arabia, Kuwait, Bahrain, United Arab Emirates, Oman and Yemen. Three more are within 300 miles: Georgia, Russia and Uzbekistan. By contrast, only Canada and Mexico directly border the U.S. and its possessions and only a few countries are within 100 miles: the Bahamas, Cuba and Russia across the Bering Sea, as Alaska geography expert Sarah Palin famously reminded us with her “I can see Russia from here” comment. In the past 25 years, from the 1991 Gulf War onwards, the U.S. has been involved in military conflict in six of the countries surrounding Iran: Kuwait, Afghanistan, Pakistan, Iraq, Syria and Yemen. Hundreds of thousands have died from U.S. military wars in the region. Two million Iraqis and 3 million Syrians have fled U.S.-sponsored violence and are now refugees in other countries in the region. From 1980 to 1988, the U.S. supported Iraq with intelligence and chemical weapons in its horrific eight-year war on Iran, which began one year after the Iranian revolution overthrew the U.S. backed government of the Shah of Iran. The Shah had come to power as a result of the American-Anglo orchestrated overthrow of the elected president of Iran in 1953. 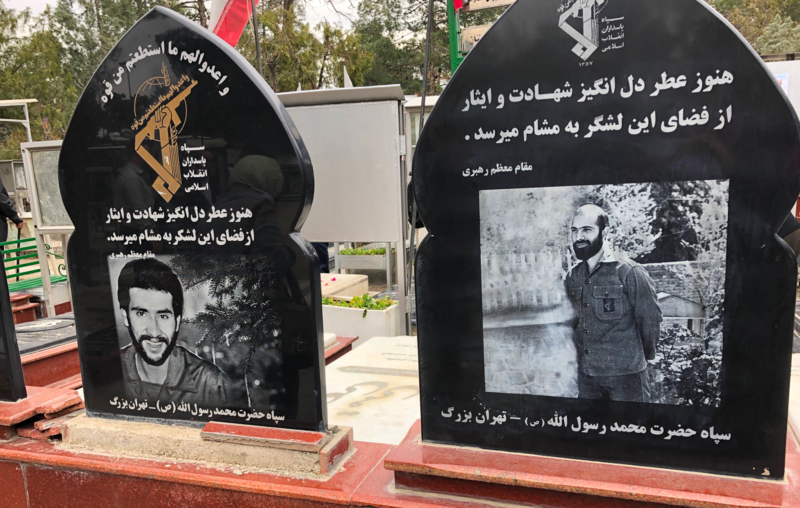 On the way from Tehran to Isfahan, we were asked to visit the massive cemetery outside of Tehran with the graves of tens of thousands of Iranians killed during the Iraqi war on Iran. It is estimated that one million Iranians died defending their country from the Iraqi attacks and that between 250,000-500,000 Iraqis died. The road leading to the cemetery has flower stands along the route for visitors to arrive with flowers to place on the graves. Thousands of Iranians visit the cemetery each day. We spoke with one older woman who said she comes to the cemetery each day as all of her sons are buried here. The entire country including very young kids were mobilized to stop the Iraqi invasion of Iran. * * * The cemetery is the equivalent of Arlington National cemetery outside of Washington, D.C., where many international guests visit to see the history of the United States through the graves of those who were killed in many U.S. wars. 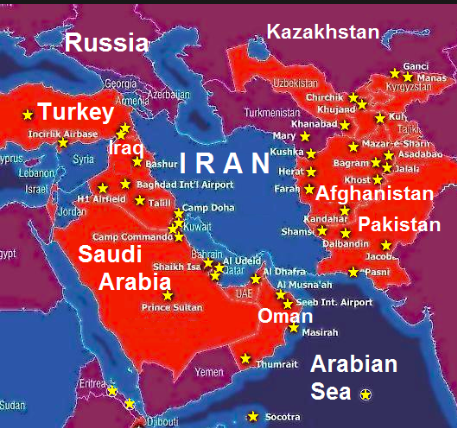 * * * The U.S. military bases surrounding Iran are a constant reminder of the U.S. military threat. U.S. combat aircraft and drones fly daily from U.S. air bases in the region. Not shown on the map are the fleet of U.S. Navy and Coast Guard ships that since the 1970s have had a permanent presence in the waters off the coast of Iran in the Persian Gulf. One incident weighs on the minds of Iranians, much as the events of 9/11 do on Americans. On July 3, 1988, the USS Vincennes, a U.S. guided-missile cruiser, used two radar-guided missiles to shoot down an Iranian civilian passenger aircraft, Iran Air flight 655, that had taken off from the coastal city of Bandar Abbas, Iran. The flight was still climbing on its regularly scheduled flight to Dubai when it was blown to pieces. Iran Air flight 655 was still in Iranian airspace, on its prescribed routine daily flight route on established air lanes, emitting by radio the standard commercial identifying data when the missiles struck. Two hundred and ninety passengers and crew, including 66 children, were killed. Earlier in the day on July 3, 1988, the captain of the USS Vincennes, Will Rogers III, had sunk in Iranian waters, two Iranian gunboats and damaged a third. Captain David Carlson of the U.S. Navy frigate “Sides” that was also on patrol in the Persian Gulf, later told investigators that the destruction of the airliner by the missiles of the USS Vincennes “marked the horrifying climax to Rogers’ aggressiveness.” Incredibly, in 1990, Rogers was awarded the Legion of Merit decoration “for exceptionally meritorious conduct in the performance of outstanding service as commanding officer … from April 1987 to May 1989.” The citation made no mention of the shoot-down of Iran Air 655. As vice president, George H.W. Bush argued at the United Nations that the U.S. attack on Iranian Airbus flight 655 had been a wartime incident and that the crew had acted appropriately to the situation at the time. He famously and tragically said: “I’ll never apologize for the United States of America, ever. I don’t care what the facts are.” It was not until 1996 that the U.S. agreed to a $132 million out-of-court settlement in a case brought by Iran in 1989 against the U.S. in the International Court of Justice. The U.S. paid additional compensation for the 38 non-Iranian deaths. While the vice president of the United States would not make an apology to the people of Iran, our delegation did. * * * Barbara Briggs-Letson, a member of our delegation, created a beautiful book expressing our heartfelt remorse. It contains several poems and the name of each person on the flight written in Farsi. We showed the book to Foreign Minister Zarif during our meeting with him and he was very moved by our gesture. 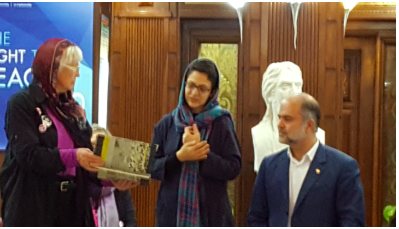 A few days later, we gave the book to the Tehran Peace Museum where it will be on permanent display. The effect of U.S. sanctions on Iran, particularly in the medical field, were brought home to us vividly by people who told us of family members who have died because they were unable to get proper treatment with the most efficient drugs due to sanctions. Dialysis patients who could be helped by state-of-the-art equipment from Europe or the U.S. are denied that equipment by the sanctions. The financial sanctions block purchase of medicines and medical equipment. Insurance companies in the U.S. and Europe are blocked from paying directly to hospitals medical bills of citizens who need emergency medical care. * * * While in Iran, a member of our own delegation had chest pains and was taken to hospital where he was diagnosed with heart artery blockage. 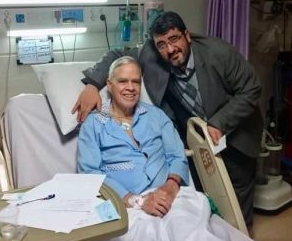 His family in the U.S., the medical doctor in Iran and a medical doctor on our delegation recommended that he not try to return to the U.S. without determining the extent of blockage and that he have an angioplasty procedure in Iran. The angioplasty showed dangerous blockage of three arteries. Stents made in the United States were placed in his arteries during the angioplasty procedure to open up the arteries. He would not have been able to travel safely back to the U.S. without the stents. When the family and the U.S. Interests Section at the Swiss Embassy contacted the patient’s insurance carrier, Kaiser Permanente, they were told that due to the sanctions, the insurance company could not pay the Iranian hospital directly, but the patient could be reimbursed after his return to the United States. The U.S. Embassy in Switzerland made a loan through the U.S. Interests section at the Swiss Embassy in Tehran to pay for the medical procedure, which the patient will repay. 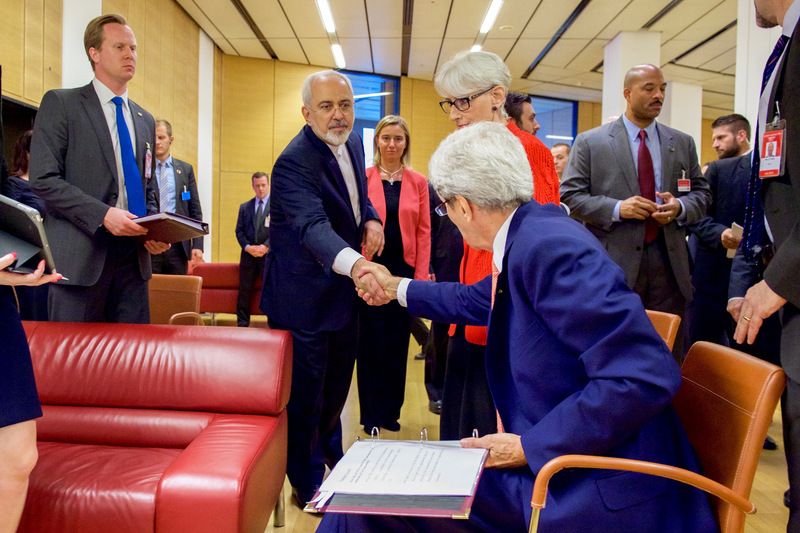 Sanctions were a topic of discussion when we had the opportunity to meet with Iranian Foreign Minister Javad Zarif. In a 90-minute talk on our first morning in Tehran, Zarif reminded us that that Iran’s 80 million people have lived for the past 40 years under some level of U.S. sanctions. U.S. sanctions on Iran began soon after the 1979 revolution and the student seizure of the U.S. Embassy and holding of 52 U.S. diplomats for 444 days. Zarif said that Iran had worked with the United States in the days after 9/11 to provide information on the Taliban, al Qaeda and other groups in Afghanistan. Iranian cooperation was “rewarded” three months later by the Bush administration, no doubt led by National Security Advisor John Bolton, with placement on Bush’s Axis of Evil list: Iran, Iraq and North Korea. Zarif also spoke of his efforts with the U.S. in 2015 to broker a ceasefire to stop the brutal Saudi bombing and blockade on Yemen. The Saudis, after first agreeing to a ceasefire, backed out of the agreement and then the United States, he said, blamed Iran, not Saudi Arabia. Much to our surprise, Zarif resigned as foreign minister only a few hours after speaking to our delegation. Reportedly, he resigned after his exclusion from a meeting held with Syrian dictator Bashar al-Assad the previous day. Other senior regime officials, including President Rouhani, Supreme Leader Ayatollah Ali Khamenei, and Islamic Revolutionary Guard Corps-Quds Force commander Gen. Qassem Soleimani had met with the Syrian dictator Assad in Tehran without Zarif being present. Less than 24 hours later, Rouhani rejected Zarif’s resignation, saying that it would be “against national interests” to accept it. In an Instagram posting announcing his resignation to the public, Zarif wrote that the Iranian people were displeased with the results of his work on the nuclear framework, giving up thousands of centrifuges and allowing inspections of its nuclear facilities in exchange for lifting of sanctions and a return to normal business around the world. But the U.S. had broken the agreement and had placed heavier sanctions on Iran and extreme pressure and sanctions on any government or financial entity doing business with Iran. Zarif felt he had let the Iranian people down. 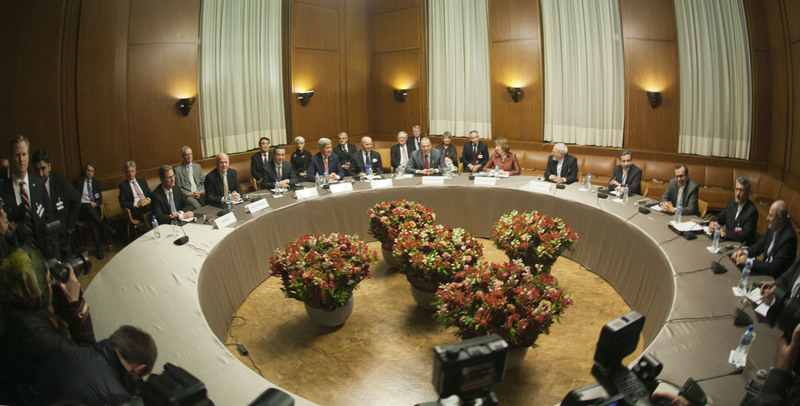 Hardliners in both the Iranian and the U.S. governments make the opportunity for dialogue and negotiations very difficult resulting in the people of Iran continuing to suffer the burden of both Iranian and American ideologies and politicians that have returned international relations to a standstill. In a move by the hardliners of Iran, on March 12, 2019, Iranian human rights lawyer Nasrin Sotoudeh was sentenced to at least seven years’ imprisonment and perhaps up to 33 years and 148 lashes. Sotoudeh won the Sakharov Prize in 2012 and was convicted following a trial held in absentia. Her husband Reza Khandan was sentenced to six years’ imprisonment in January 2019. The European Union has stated that the right to protest peacefully, as well as the right to express opinion in a non-violent manner, are cornerstones of the International Covenant on Civil and Political Rights, to which Iran is a party. Ann Wright was in the U.S.Army/Army Reserves for 29 years and retired as a colonel. She was a U.S. diplomat for 16 years and served in U.S. embassies in Nicaragua, Grenada, Somalia, Uzbekistan, Kyrgyzstan, Micronesia, Afghanistan and Mongolia. She resigned from the U.S. government in March 2003 in opposition to Bush’s war on Iraq.